The number of "New Year" stories mentioning Rachael Ray is astronomical! Usually it's just a little mention here and there about how she has a magazine, a talk show, cookware, EVOO, cookbooks and her Food Network shows. Booorrrriiiinnngggg. We already know all that! So, when I ran across this story in the Wichita Eagle, I just had to share it. The writer, Joe Stumpe, says that while some of his colleagues think that the spinach e-coli outbreak or school soft drink ban stories where the highlights of 2006, he "thought the No. 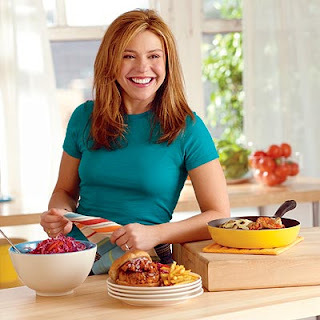 1 story was obvious: the cloning of Rachael Ray." He notes that she is even on his box of Ritz crackers and managed to get EVOO in the dictionary. As for the first charge, Ray has never claimed to be a real chef -- that's a big part of her appeal, the idea that anybody can do what she does in the kitchen. I'm pretty sure that some of her recipes do take longer than a half-hour to prepare, but this is part of the hype inherent in her business. I'd be a lot more concerned if her recipes didn't taste good. And as for perkiness: What's the alternative? Watching a glum-faced chef prepare food? I've seen it happen, and it's not pretty. I'm for anyone who gets people cooking, and Ray obviously does that. Tabloid headlines or not, I think Rachael will be fine. I wish her and her clone all the best in 2007. I'm afraid Rachael (I just found out how to spell her name, du-oh) will become overexposed, like Martha Stewart. You know, I really liked Martha 15 years ago — her show was interesting, useful and about as genuine as Martha can get. Now she's boring and a charicature of herself. I hope this does not happen to Rachael. I like her perkiness. Well, I don't mind it. Hey, 15 years isn't a bad run! Rachel - you are welcome!